Click here to view further pictures and information about HM The Queen's visit. 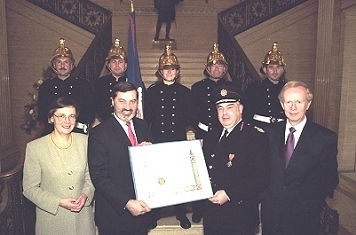 "That this Assembly will institute an Award that recognises the great sacrifice and commitment to duty of members of the Fire Service in Northern Ireland and liaise with the Fire Service unions/representatives to examine any further awards." An Assembly Award is a prestigious civic honour which is made on very rare occasions and only after the successful presentation of a Motion to the Assembly. This is the first Award of its kind. The Assembly Commission decided that the Award should take the form of an illuminated scroll. 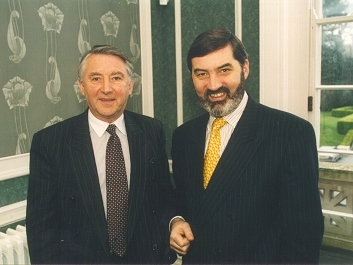 This was presented by the Speaker of the Assembly, Lord Alderdice at a special ceremony which took place in the Great Hall, Parliament Buildings on Tuesday 17 July 2001. A reception was hosted in the Long Gallery to which Commonwealth Games medallists, students from Commonwealth countries who were studying in Northern Ireland and representatives from ethnic minorities were invited. Winners of a competition run be the Assembly for all primary 7 school children the theme of which was "Celebrating Diversity" were also invited. 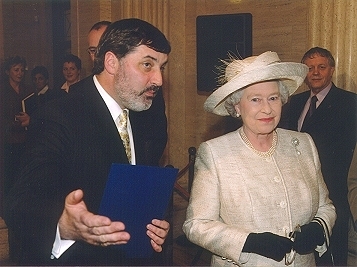 The celebrations began with a welcome by Lord Alderdice, President of the Northern Ireland Assembly Branch of the Commonwealth Parliamentary Association. The Messengers choir from Uganda put on an impressive performance of song and dance in their colourful traditional costumes. The Minister of Culture, Arts and Leisure, Mr Michael McGimpsey, launched a multimedia exhibition on behalf of the Community Relations Council and Lord Glentoran, who was the keynote speaker, gave a speech reflecting on the importance of the Commonwealth in all areas of life. A collection of 46 Rowel Friers drawings of Members of the Northern Ireland Parliament, which was prorogued in 1972, was purchased on behalf of the Assembly Commission at auction on 4 February 2002. 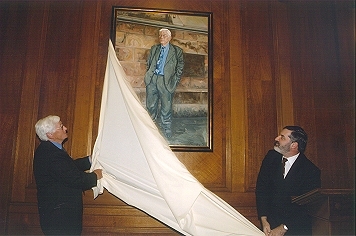 The Speaker launched an exhibition of these drawings on Tuesday 28 May 2002 in the Long Gallery, Parliament Buildings prior to them being removed for restoration. It is planned to put the drawings on permanent display in the Members' Bar in Parliament Buildings in due course. 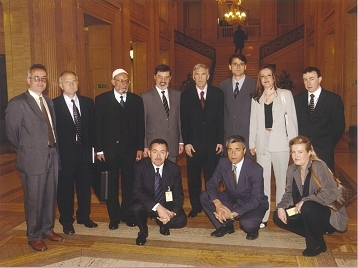 A Conference for Speakers, Presiding Officers and Clerks of United Kingdom, Ireland, the Isle of Man and the Channel Islands was hosted by The Speaker, Lord Alderdice on Thursday 27 and Friday 28 June 2002 in Parliament Buildings, Stormont. The Conference Report can be accessed from here. 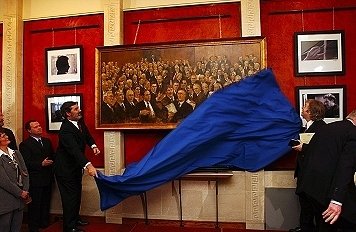 Click here to view further information about the Assembly portrait. Click here to view further information about the portrait.